Whether you want a refreshing glass of lemonade on a hot summer afternoon, or savor a glass of fresh orange juice with your breakfast, Vollum's Manual Juicer gives you the convenience of freshly squeezed juice right in your own home or food establishment with professional quality. 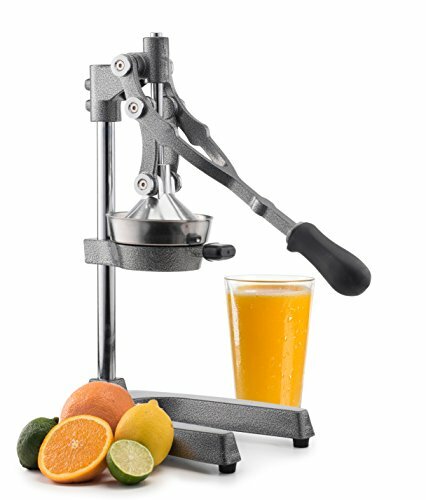 Squeeze your favorite citrus fruits with this Manual Juicer, and juicing is a breeze! Vollum's Manual Juicer is designed for durability and ease of use. Simply place fruit halves on the stainless steel cone and pull down our long lever. Our ergonomic, rubber coated handle with high leverage allows you to squeeze fruits dry in one simple motion without straining or leaking. Our stainless steel cone and funnel strain the fruit's juice while keeping seeds, pith and peel out of your glass. Both pieces are removable and dishwasher safe. Freshly-squeezed juice offers several perks over store-bought varieties. Our Manual Juicer squeezes your fruit's pulp and rind in addition to the juice to, creating a fresher, richer flavor. Fruit juices freshly squeezed from this hand press quench your thirst and leave you feeling refreshed without preservatives, high fructose corn syrup, or excess sugar often found in prepackaged varieties. The former is also a good source of vitamin c and antioxidants, and a way to get kids to consume their fruits and veggies. Here at Vallum, our goal is to deliver premium quality products that enhance your preparation and consumption of food and drink, one of life's greatest pleasures. With our practical, well-designed products, the sky's the limit for what you can create in the kitchen, whether in your own home, restaurant, or other food establishment. PRO QUALITY: This professional squeezer brings commercial kitchen quality and strength into your home! It has immense crushing power, and squeezes fruits big and small, from limes to pomegranates. EASY TO USE: Grasp our ergonomic handle while pressing down the hand lever. This efficient juicer squeezes fruit dry! All parts that touch the fruit are removable and made of dishwasher safe stainless steel. DURABLE CONSTRUCTION: This heavy duty juicer is built for long term use and withstands pressure up 2,300 PSI of pressure. Its sturdy "u" base is made of enamel coated cast iron, resistant to citrus acid. MESS FREE JUICING: No more juice squirting all over your hands and counter top when you squeeze a fresh cup. No more aching wrists from over-squeezing, twisting and turning to yield just a few drops. ENJOY FRESHLY SQUEEZED JUICE: Extract citrusy, fresh juices from oranges, lemons and grapefruits of any size while powering up with vitamin c and antioxidants. Tastes better than store-bought juice! If you have any questions about this product by Vollum, contact us by completing and submitting the form below. If you are looking for a specif part number, please include it with your message.